My word that was a windy night, fortunately we'd battened down the hatches last night so there were no problems. Clearly we were not in the information loop regarding the bathrooms this morning. We'd had a lie-in due to our total lack of motivation, before setting off for the showers. Well I say we, as it turned out it was only I, as The Chef stayed behind to get tonight's creation in to the slow cooker. The shower cubicles here are really large, in fact the bathroom/laundry complex takes up the whole of the ground floor of the facilities. Above them are the bar and recreation room, well when it's open that is. So there I was, shampoo rubbed in to the hair, shaving gear at the ready, shower gel on standby, powerful shower turned on.........wait..........keep waiting..............be patient..............it'll be here soon.................bugger - no hot water! I had to wash my hair and the rest of me as quickly as possible under cold water. This must have been the Manager's revenge, I thought, after I sent a letter offering 'constructive criticism' after our month stay here two years ago. Returning to the motorhome I found The Chef about to set out for her shower. I told her the problem, but being the trooper she is, off she went. Needless to say, she wasn't gone long. She's spoken to somebody in the shower block and apparently the hot water had been turned off fairly early this morning due to maintenance. Apparently there had been a notice put up, well we didn't see it. You'd have thought they'd have mentioned it yesterday when we booked in. Today was to be another wander down to the town, same route, same views, same strong wind blowing. The exciting thing we were going to do in town today was to buy a Spanish LPG regulator valve. My thinking is that in future, should we run low on gas in this part of the world, I would have the option of Plan B - rent a Spanish LPG cylinder and use that. We had a lot of noisy dogs on the campground at that time, but things were not helped by the constant loud barking of a large dog which spent the whole day outside on one of the top balconies of a small block of flats next door. Eventually I went to see the campsite manager, who turned out to be Scott, at that time the relief manager, standing in for the manager who had gone on holiday (Scott's still here, and now the Manager). I told him the problem and he was very helpful and keen to get it sorted out. I was led to believe that he was to phone the police. Somewhere along the line I learned that the local police give a dog owner two strikes regarding a dogs bad behaviour, on the third occasion it's taken away and shot. The barking stopped for a day or two and then it was back to normal, a dreadful noise. Back up to see Scott I go, now he's even more determined than ever (new boy see, dead keen) to sort it. So during the 'dog' discussions onsite I'm telling folk about what the Spanish police do to problem dogs. Next thing - total silence. The dog on the balcony - nothing. All the yapping, barking mutts on site - silence. Campers were coming up to me and telling me the dog had been taken away and shot. The downside was that The Chef was really annoyed with me because I'd caused the poor dog to be shot. "Look" I said, "Don't blame me, blame the irresponsible owners, It's their problem to sort, not mine". Well for about a week I enjoyed silent bliss. Clearly all the campers with dogs thought their mutt could be next, and made the effort they should have always made, to ensure their dog was not a nuisance to others. Eventually I went and spoke to Scott. By now I was getting to know him better, I'd even bought him back a carton of duty-free fags from a day trip to Gibraltar. He told me that on the first occasion he had phoned the security guard over at the complex and requested that he speak to the owner regarding the noise. Obviously that didn't work. On the second occasion I spoke to him he went to see the owner personally and told her the dog was being a nuisance. She apologised and said that in future she would not lock the dog out on the balcony all day while she was at work. That's why it all went quiet. I returned and told The Chef that the dog had not been shot, but she was to tell nobody because as long as the campsite dog owners think it was shot, we get a bit of peace. ..........Now where was I? Ah yes, it was a sunny but windy walk to the town, through the very typical Spanish fishing village, Castillo de la Duquesa next door to the campsite, along the promenade to Puerto de Duquesa, then beyond that to the town. In fact we were to go to the very edge of the town, firstly to buy the LPG regulator from a hardware store which sold quality products, probably to the trade. I showed the young lady what I wanted, written on a piece of paper. I had written 'Spanish Liquid Propane Gas Regulator', and underneath it, having consulted the Spanish-English dictionary written the Spanish words. She understood completely, took me to where they were, showed me the range and job done - one sale. Secondly, it was in to the Lidl store next door for a number of shopping bits, before setting off back for Puerto Duquesa, home of that golden nugget, discovered two years ago, the British Butcher shop. British lads who were giving the Ex-Pats what they wanted - meat butchered in a familiar way, though they're not cheap. That done we wandered back to base camp for a late lunch and a sit in the sunshine. Although we can pitch our chairs on the leeward side of the motorhome, nobody tells the wind that it's not supposed to blow UNDER the vehicle. Never mind, a nice day, not brilliant, but nice, and spent in the company of my darling Chef. 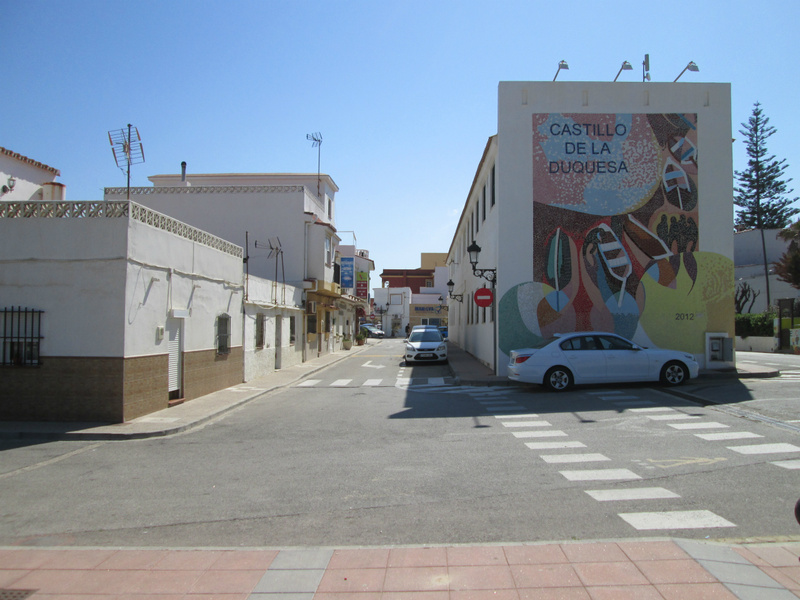 As for photographs, I thought I'd attach a few of the village next door to today's offering, then tomorrow perhaps some pictures of the Marina, Puerto Duquesa, and finally the town, or maybe the other way round. I just can't make my mind up.